Spy pictures show the next Ford Explorer crossover could make extensive use of aluminum for the doors, hood and tailgate. 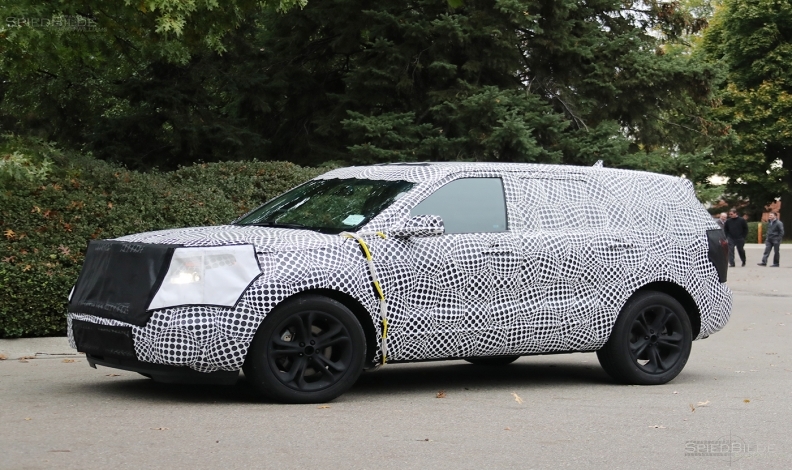 The next-generation Ford Explorer was caught during testing recently on public roads. The vehicle, due out possibly as early as summer 2018, appears to be growing in size. The spy pictures show the crossover could make extensive use of aluminum for the doors, hood and tailgate. The flat body panels are a clue. Ford’s aluminum suppliers, Alcoa and Novelis, have been working on new blends of aluminum that won’t crack when stamped into shapes that have deep draws or curves. But they may not yet be ready for mass production. Ford and other automakers are looking to remove weight and boost the fuel economy of crossovers and SUVs to meet a U.S. federally mandated 54.5 mpg fleet average fuel economy standard by 2025. The next-gen Explorer appears to remain front-wheel drive, with optional all-wheel drive. It’s also a prime candidate for a new fuel-saving nine-speed automatic transmission, co-developed with General Motors. The Explorer was last overhauled for the 2011 model year when it shed its truck-based mechanicals and adopted Ford’s front-wheel drive, unibody platform that underlies the Ford Taurus sedan and Flex crossover.